Philadelphia Eagles head coach Doug Pederson. The Philadelphia Eagles offense was among the best in the NFL for much of the 2017 regular season. And, as you know, it took a devastating hit when quarterback Carson Wentz was lost for the season with a torn left ACL in Week 14. Prior to Wentz's injury, the Eagles were averaging 31.1 points and 390.5 yards per game. In the four games since, it's been a pedestrian 17 points and 277.5 yards per game, which would be the worst in the NFL. What they're saying (in Minnesota): How confident are Vikings fans about facing Eagles? However, in those four games, including Saturday's 15-10 win over the Falcons to advance to the NFC Championship Game, the Eagles are 3-1. The offense hasn't played nearly at the same level it did under Wentz, but it's been enough to get the job done – and the one constant throughout has remained is head coach Doug Pederson. Of the six of coaches hired in 2016, three of whom have already been fired, Pederson is the first to make it to a conference title game, despite losing an MVP candidate at quarterback, not to mention several other Pro-Bowl caliber starters, along the way. 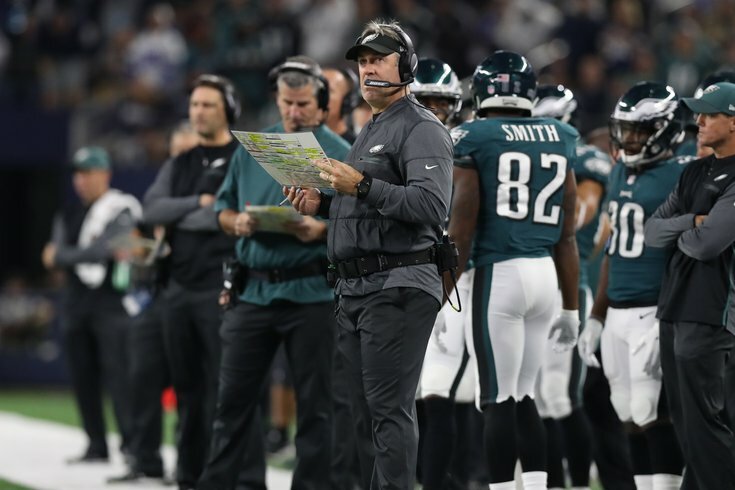 For proof of Pederson's development as a head coach, and specifically as a play-caller, look no further than the masterful game he called in the divisional round. It was such a well-coached game that even mortal enemy Mike Lombardi, who before the season called Pederson the most unqualified coach he'd seen in his 30-year career, had to issue a mea culpa of sorts. On Wednesday, the second-year head coach was asked if he felt vindicated now that he's quieted the critics. "Listen, I don't really pay any attention to that, quite honestly," Pederson said. "I drive home at night knowing I put in a full day's work. I get up in the morning to come in here, and however I can serve this organization and serve these players [that’s what I do]. That's all I know. I love football. I love coaching football. I love teaching it. I love being around these guys, and I'm going to pour my life into these players. "If it's good enough, great, because that's all I know I can do and I've given it my best effort. So I don't care about what's written. It's kind of like the underdog thing. Our players don't pay much attention to that. And I'm kind of the same way." In that win over the Falcons, Pederson's commitment to the run helped the Eagles avoid too many third-and-long situations, something that has been an issue since Nick Foles took over. On the Eagles' lone touchdown drive in that one, they faced just one third down, a third-and-three from the Atlanta 24-yard line. And here's a look at the play Pederson dialed up, one we hadn't really seen this year, but would see again later in the game. In a big spot early in the game, that's a ballsy call from a second-year coach. And it worked to perfection. "You either have it, or you don't," Pederson said of his play-calling ability. After some growing pains in Year One – and more than his fair share of doubters – it's beginning to look like Pederson is one of those coaches who "have it." "Coach [Pederson] has just had a knack of seemingly to call those at the right time," offensive coordinator Frank Reich said Tuesday. "As far as how we game plan them ... We get an idea, we kind of sort through it, debug it, does it fit us, how would we do it, and we try to look at four, five, six of those things every week. Sometimes more than others. Sometimes we think we like something and we go out on the practice field and doesn't quite look like it's ready. So, we have to say keep it in the crockpot for another week or start over with a new recipe." It's one thing to add a play to your playbook just to have another option. Calling it in the playoffs for the first time, that's a whole different ballgame. Just imagine if the Falcons had stopped Agholor short of the first down and the Eagles had to settle for a field goal – not only would Doug be getting crucified for that call, but the entire game may have turned out differently. But that's who Pederson is, an aggressive and, according to Reich, "unorthodox" coach. And it's been an eye-opening experience for Reich, who admits that he's even surprised at times by the plays Pederson dials up. "What I've learned about him and through watching him call plays is he's probably a little bit more unorthodox at times, in a good way – calling two screens back-to-back, for instance, the other day," Reich said. "Some of the stuff, there's other examples that I don't even want to get into just for competitive advantage reasons, but there's other things that he's called that at the time I thought, that's unique, I'm not sure that would have hit my brain like that. And many times those things have worked out, so that's been fun to see and fun to work with." Pederson didn't argue with that assessment when asked about it on Wednesday. "If you just look what I have done in two years, you would probably call me unorthodox, based off what I have done on fourth downs, two-point conversions, things like that," he said. "Sometimes you don't do the norm. Don't do what everyone expects you to do. Sometimes that can help you. "I'm calculated about it, but at the same time, I'm going to make sure I'm putting ourselves in a good position." A few plays after that handoff to Agholor, Pederson again found himself in a tough spot with the Eagles facing fourth and goal from the one-yard line. Again, Pederson remained the same aggressive coach he's been all season; the Birds, after all, were one of the best fourth-down teams in the league during the regular season, converting 66 percent of their attempts. And even though handing it off to LeGarrette Blount seemed like the obvious call, conventional wisdom would tell you to run the big back straight up the middle. "I just think if you're not staying aggressive, you're not giving yourself a chance to win the game," Pederson said. "Throughout the year I wanted to make sure I was doing that and doing right by the team." So far, the results speak for themselves.